In my search for more information about the Die Bienenkiste hive I've accumulated quite a few German YouTube videos about beekeeping in that country, which I've found extremely interesting - despite not knowing more than half a dozen words of German ! A YouTube search will locate these, but note that I've had to alter those characters with twin dots above to make 'em viewable. The 3-part series is of a commercial operation, and in the last video there's a rather neat tip for ensuring that a Queen is accepted into a new NUC. If you need any help with the translation, just pm me. I am intrigued by these hives, but I can't entirely figure out exactly how they are constructed. I also have one concern - doesn't turning the comb almost upside down result in a lot of nectar running out of the combs? Roughly translates into: If you can buy toggle fasteners with a short anchor, the anchor of the toggle fastener can be screwed directly to the narrow side of the floorboard, so bending and such is not necessary. Do you have/know of any photos that explain how the removable top bars are held in place? I can see that there is a castellated component that keeps them spaced correctly - does this also hold the bars against the roof? And the same arrangement at the other end? Rail 1 is fixed to the front board, screwed from the inside to the wall. 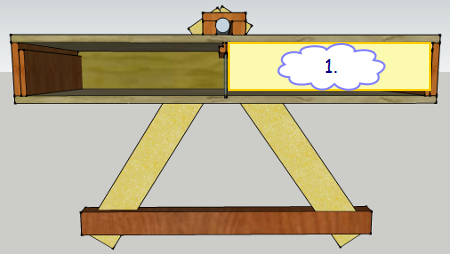 Rail 2 is double-sided, with a noose left and right. One side to hold the topbars of the brood area, the other side to hold the honey combs or the divider board. 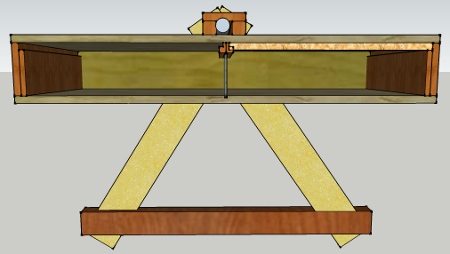 There is another rail on the far right side where the back entrance is to hold the honey comb topbars in place. 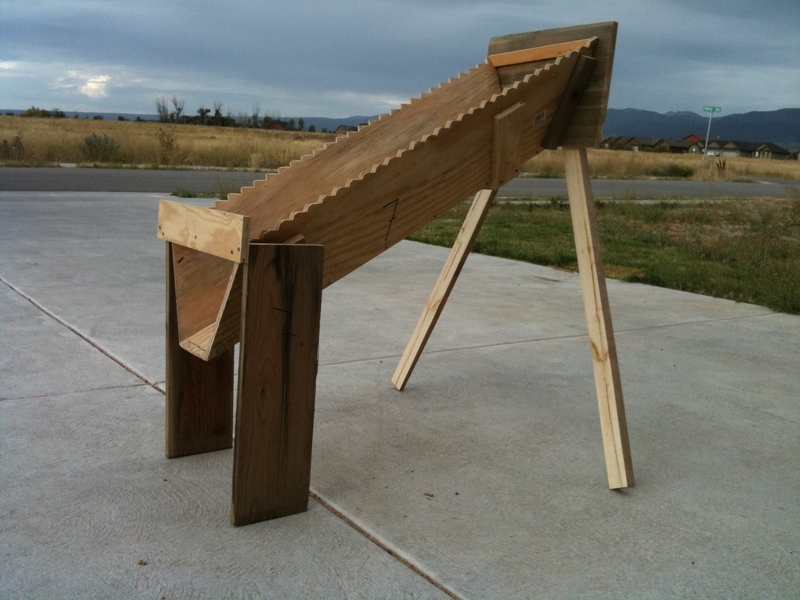 That rail looks similiar to rail 2, with one nose/rebate only. Rail 2 is screwed from the outside, so if you want to remove the brood bars, you stand up the hive, unscrew the rail 2 from the outside and lift out one comb after the other. First of all, I'd make the topbars of both brood and honey section the same length. Thus combs can be swapped between the sections. So the box is divided in half. As a divider, I'd used a fixated queen excluder, permanently in place. 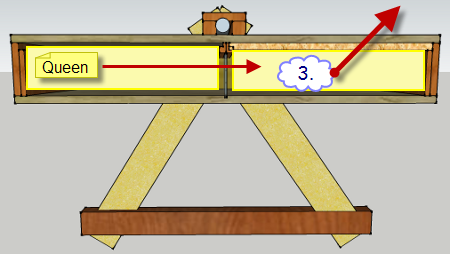 Both end boards would be movable and rebated. The hive gets populated on one side of the hive. Within the first season the one side should be filled easily. Only the entrance on this side is open. Next spring right when the main flow starts at the beginning of May, the queen is caught and put with one brood comb on the other side of the hive. Entrance on this side is opened a couple of days later, when things settled in this side of the hive. The bees start drawing new comb where the brood is. The brood in the comb on the other side hatches and because no eggs are layed there, they soon get filled with incoming nectar. Once combs are filled, they are removed and again the queen is put on the other side of the hive for the next flow. So that is how I would use that sort of hive. Well, I said...would...personally I don't see any advantage in using such a hive. I think a regular TBH might be better off. I can see what they have in mind - starting bees at the top and backfilling all the way down, I presume. Has anyone tried one for more than a year? Well, yes. Beekeepers seem to be inventive of some sort. the first is the Queen Excluder - no need to cause difficulty for, or damage to any of the bees by requiring them to squeeze through tight openings - just a partial partition which effectively prevents Her Majesty from straying away from the brood area. Nice. I'm sure that feature could translate across to other designs, if a restriction of the Queen's movements should be high on the agenda. But it's the second feature which really excites me - unlike all other long hives, the Bienenkiste has the combs arranged longitudinally along the cavity, just as would normally occur in a feral hive, which of course allows the cluster to migrate back and forth along the comb array without encountering obstacles. I see the ability to migrate along combs easily as being one of the major strengths of the vertical hive configuration, and I'd like to see this ease of mobility incorporated into a more 'conventional' horizontal hive. So - what my thinking is (or rather 'was', as I've put this on the back burner for the winter) - is to build a Bienenkiste with a removable top, rather than the classic removable bottom. This - in effect - then becomes a T-TBH with the bars arranged lengthways, rather than across the box. As I see it, the challenge is then two-fold: how best to support the 2 sets of Bars where they meet, and how to fit the removeable partition at that point - and secondly, how best to manage the hive in terms of day-to-day operations. I've played with several methods of support, with and without a slot for the partition board, and I don't see that as presenting a problem. But with regard to managing the hive itself ... I can't see any solution to this. The beauty of the classic Top Bar hive lies in the ability to move it's Bars at will - expanding and contracting the size of the cavity as required. But I cannot immediately see how that could be done with a longitudinal Comb configuration. Much to think about there - but I'd like to think it could be done. That would be something I don't believe I've seen before. Pulling and rotating those bars would be a challenge, I think. There is a video that shows the removal of mature comb from the Bienenkiste, but I don't think I'd want to do it on a regular basis. I could see torque being a problem with fresher comb (one end leaning "right" and the other "left", leading to tearing perhaps?). Acceptance by traditional beekeepers of the Bienenkiste here in Germany ranges from curiosity and open-mindedness to ignorance and contempt. It's target audience and goals (a more natural, potentially less invasive approach; greater focus on the bees and less on honey production and sales) are somewhat different from those of most traditional beekeepers in Germany (so far). Furthermore, by its nature of being something new and unfamiliar to experienced keepers, those beginners (like myself) starting up with the Bienenkiste tend to be more or less on their own, without the over-the-shoulder support of an experienced hand; thus things in the beginning can be a bit more precarious if mistakes are made. Of course, this (going it alone, no "mentor beekeeper") is what most traditional beekeepers view as exactly the wrong approach for newcomers and this perhaps also colors their opinion. But this should hopefully change as the hive becomes more established. Furthermore online support is good (mailing list, extensive Web site) and there is now a book. Some (emphasis on some) traditional beekeepers are also becoming more familiar with the hive; even if they themselves would never use one, they are becoming more open, I think, to assisting those who want to, as they are beginning to recognize that many roads lead to Rome and that today's "Bienenkiste-Keeper" is simply tomorrow's beekeeper -- something still much in need. 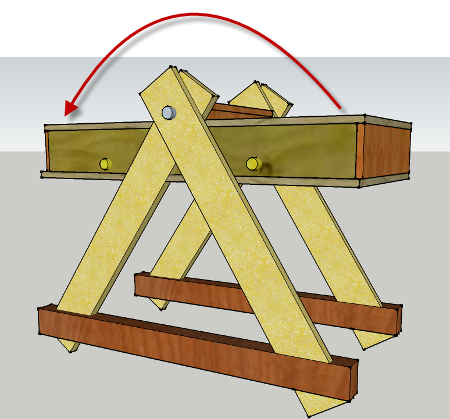 Rail 2 (the T-bar) should be secured with one or more screws from outside (above, in normal orientation), particularly if the hive is to be transported. 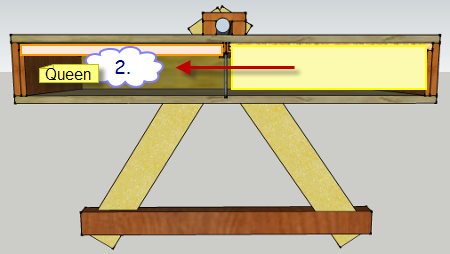 Under normal conditions, the hive is always tilted from behind, but by transport there is the risk that the front end of the hive could become higher than the rear; without this safety screw there is the risk that this T-bar (rail 2) could be forced to shift to the rear (particularly when there are no bars in the honey room), allowing some or all of the brood bars to slide off of rail 1. Although I've never done this myself, to remove brood comb, I think you will end up also having to remove the two side posts that support rail 2 (the T-bar). These are each held in place on the inner side wall of the hive by two threaded bolts that are likewise removable from outside the hive (they thread into "T-nuts" that remain attached to the posts). I find TBHs appealing. As I understand them (e.g. after reading Philip's book), top-bar hives require somewhat closer management and regular monitoring (use of follower board, etc.). The Bienenkiste also needs inspections during the swarm season, but otherwise there is normally no removal or handling of frames (other than the single honey harvest). It's intended to be as low maintenance as possible while not fully ignoring the needs of the bees. In my opinion, one of its greatest advantages is the low profile. You can keep it in a small yard or flower garden and it becomes almost invisible. There's a great pleasure in being able to remove and closely examine a frame of brood from the hive (e.g. Langstroth, top-bar), but likewise the chance to open a hive and be able to view the hive structure intact in its entirety is also quite something to behold. But more to report later -- I'm still in my first year of beekeeping with the Bienenkiste. I came across the Anton Janscha hive (again !) in a recent YouTube video I found, which was of course based on the Farmer's, Bauer or Peasant stocks - depending on which history book you read - and on which the Bienenkiste hive was apparently based. I just wanted to add a note that I am in the process of translating the Bienenkiste Web site (source of the videos) into English. The raw translations can be found in the Bienenkiste English-language sub-forum. P.S. Almost two years later, my two hives are still doing well in our Berlin rooftop garden. I just wanted to add a note that I am in the process of translating the Bienenkiste Web site (source of the videos) into English. Kevin - that's excellent news - I'm sure this method of keeping bees will spread far and wide as a result. It's also excellent news that your bees are doing well - although, to be honest, I'm not surprised as I think this is one of the better ways of keeping bees.